Should We Chat About E-Readers Now? Oh yes. I brought it up and you knew it was coming. A blog about books and writing without one post on e-readers? I couldn’t let The Anxiety of Authorship be too unique. I’m breaking down to talk about this now because I do have some information from the publishing industry. Not huge information, but something on the subject. A few weeks ago, we received an email that a new digital/e-book sales team was being implemented. This means it’s real. E-books are a real thing that are going to have their own nook (no pun!) in our company. It was a smart business move–publishing houses have to keep up with technology and do what they can to be monetarily efficient. So the professional in me feels good. The consumer in me is a little worried. I guess before I got the email, I didn’t really believe in all of it. Not that I didn’t know e-books are a big deal–and I even have a Kindle I received as a graduation present last year–but I just couldn’t see it. I couldn’t see all of the books on every shelf in the world becoming invisible. Well, that’s extreme. I still don’t think that will happen. And I’m definitely not opposed to e-readers at all. They’re a spark in our culture where reading for pleasure isn’t a given for the majority anymore. I think there’s too many people out there who are passionate about the individuality of each book–the art, the feel, the smell–to let what happened to CDs happen to books. Maybe it’s because we all saw how Napster and subsequent MP3 programs ruined the CD–and we were all probably part of that demise too. These changes don’t have to be evil, though. To reference the keynote speaker at my college graduation, Michael Korda (Editor-in-Chief emeritus of Simon and Schuster, actually), the change from paper books to e-books could be as monumental as the change from etching words onto stone and parchment to the advent of the printing press. We don’t need to resist it. I just don’t want it to kill the industry. I don’t want to see authors and publishers not getting paid for their work because everyone is just downloading books illegally. And I certainly don’t want to see all of the bookstores, both indie and mainstream, close up forever. Poor Borders. A happy medium would be amazing. But is it possible? I think books might start to offer an ebook option similar to when you buy certain movies and inside there’s a code to download the movie or in this case book in ebook form as well. This would be good! That way people get the convenience of the e-book without totally wiping out physical books. It would just be a double option. *sigh* Hopefully it would work. I really don’t want to see bookstores go out of business. E-books/E-readers are such a touchy subject. I was 100% against it but, after I got the Nook Color as a Birthday gift, I didn’t find it so bad. I think its amazing that I can have 50+ books at my disposal all at once (especially because I tend to read very fast and about 3 books at a time). Vacation was super easy because I didn’t need to add the extra room for a few books. That being said, there is nothing like the smell and feel of a physical book. When I come across a novel I am really passionate about, I go out and buy the actual hardcover to put on my shelf. 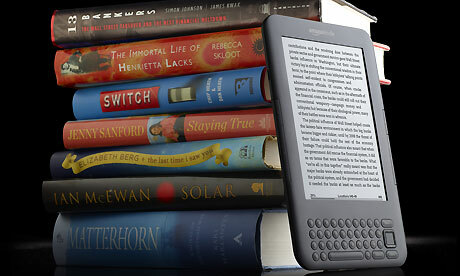 And the thing I really hate about E-readers? They are delicate and battery operated. You don’t have to worry about your paperback copy dying on you or breaking if you drop it. Unfortunately, the Kindle I was given for my graduation present is just black and white, but I had always told myself I’d only get one with color so that I can see each book cover in full color. I’d also worry about dropping it or the technology just crashing (who hasn’t had that happen with computers before?). I could be wrong but I think the books are stored on the account, not necessarily the e-reader itself–so if say you broke yours and got a new one, you could still have all your books by logging into your account. I’m pretty sure I’ve already spoken to you about this subject, but I bought a Nook Color this summer in preparation for grad school. This semester, a couple of people in my cohort also bought e-readers, so we’ve been able to cut the costs of textbook buying (hard copies would have cost us almost $600 each, but instead we were able to spend closer to $300), AND we don’t have to lug all twenty something books with us to campus each day. Unfortunately, not all textbooks are available on e-readers yet, and I have to do some finagling to get books I purchase from Amazon onto my Nook. Free software like the Nook study app for PC and Mac also let you print pages from your textbooks for your reference, and allow you to read two separate texts at the same time (would have LOVED this for Ulysses+Annotated Ulysses!!!!). That being said, so far, I have only finished reading one book (a free book– The Count of Monte Cristo) for pleasure on the Nook. It does seem very impersonal, and you certainly do miss out on the experience of reading. But— it was FREE and I get to keep it! How can I complain, when I’m living on a research assistant’s salary??????? Long story short, I HIGHLY recommend the e-reader for any students, especially if a couple of your friends in the same program choose to split costs with you. For those of you lovely people who like the feel of pages, the smell of it, and even the experience of physically writing in the margins and dog-earing your favorite passages, stick with hard copies– for now.